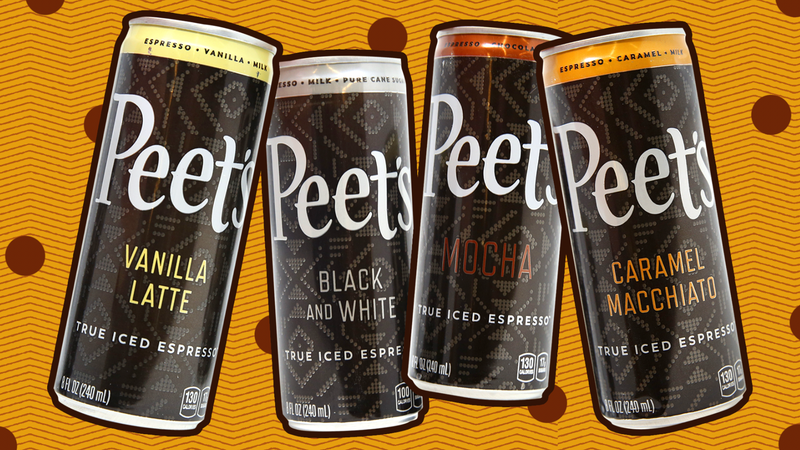 It’s not really the season for iced espresso in a can—in fact, Peet’s launched its “True Iced Espresso” line this past summer. But there’s something really nice and convenient—when it’s mid-afternoon and you’re hankering for caffeine and are sick of office coffee and Diet Coke—about an attractive, immediately available espresso package, even in the wintertime. And Peet’s, a longtime, San Francisco-based national brand that has its own retail outlets as well as being sold in grocery and specialty stores across the U.S., appeared to be a master of the espresso game. So, trying to get over the post-holiday hump when I slept like my house was an opium den or had a gas leak (maybe it does? ), I decided to chug all four Peet’s Iced Espresso cans over a single workday. Sure, my productivity was bound to skyrocket, but how did the flavors taste overall? First off, from a texture standpoint, Peet’s has it down. I had to check the cans to see how they achieved that thick, smooth consistency: just espresso, milk, cream, sugar, some pectin to thicken. The iced espresso base itself was very impressive. But the flavors themselves—Black And White, Caramel Macchiato, Mocha, and Vanilla Latte—hung out mostly in the middling variety. Maybe I don’t get the whole Black And White concept. Like last year’s Starbucks Black-And-White lineup, this can just tasted blah to me. Thankfully it was not cloyingly sweet, but it just didn’t offer any other flavor, coffee or otherwise, to replace that. There’s mild, and then there’s a black hole of flavor. This is more like it: A subtle but still enticing caramel flavor that, again, doesn’t pummel you with sugar like a similar drink at Starbuck’s would. Creamy, rich, and wholly satisfying, without defaulting to becoming a candy beverage for flavor. Okay, this is too subtle. I kept sipping the Mocha trying to discern some sort of coffee-chocolate flavor, to no avail. Were my taste buds broken after so much caffeine? Nope, I could still taste the caramel in my previous sample. But search though I did, I could pinpoint neither coffee nor chocolate, but an annoyingly vague sweetness. This has a vague similar taste to the Mocha, although lighter, and sweeter. (Granted, vanilla is not usually a super-strong flavor to begin with.) Fans of the sugar-saturated Starbucks drinks would probably like this one the best, but “sweet” is not my favorite flavor, so I would give this one a pass. Overall, the Peet’s Iced Espresso line is a tad disappointing. The lacking flavors (except for the caramel) fail to live up to that delightful beverage consistency. Such wonderful espresso deserves some better taste additions: maybe cinnamon? A harder-hitting dark chocolate? Still, in an afternoon office slump, there may be a moment when having a Peet’s Iced Espresso can on hand just might do the trick. I don’t necessarily recommend four in a row, though, although I now have a delightful caffeine buzz that will no doubt carry me through the evening.